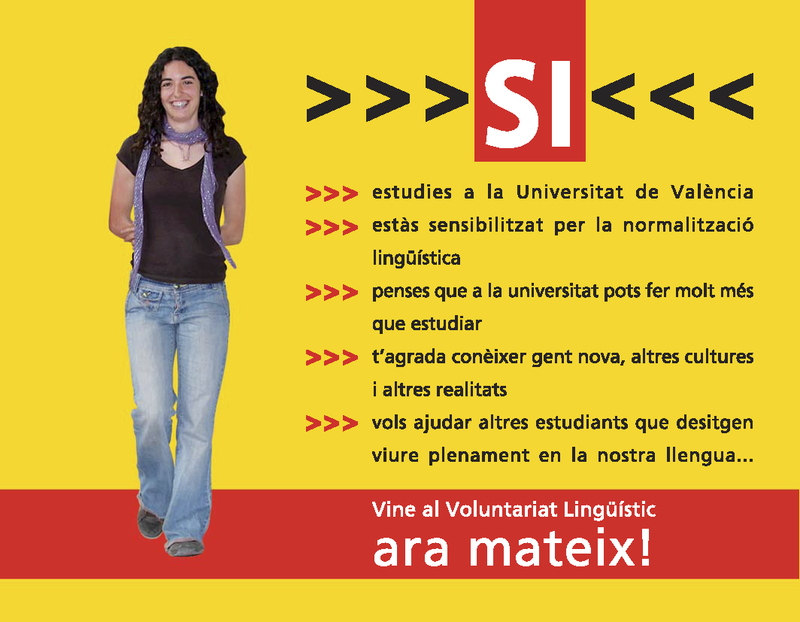 Linguistic Volunteering is a project of the Language Policy Service (SPL) of the Universitat de València where all the students participate. To consolidate a large group of students with a high level of linguistic awareness, provided with information of quality to distribute it within the university community. Definitely, to reinforce the support network of activities related with the promotion of the use of Valencian and multilingualism. » Dynamization and training activities such as meetings, reunions, dinners, workshops, cinema, theatre, etc. »Active participation in SPL campaigns; promotion of teaching in Valencian, receiving foreign students, etc. » Personal contact with other students that, like you, want to achieve full standardisation of Valencian and to promote multinlingualism. Fill the registration form for the Linguistic Volunteering. We will send you a message to confirm that we have receive the information and to welcome you into our membership. When formalising your registration we will subscribe you to the mailing list of the Volunteering through which you will receive the information about campaigns, activities we organise and you will be able to exchange information with other members, such as propose or spread projects and activities. We will also tell you the name of the Facebook Group of the Volunteering.